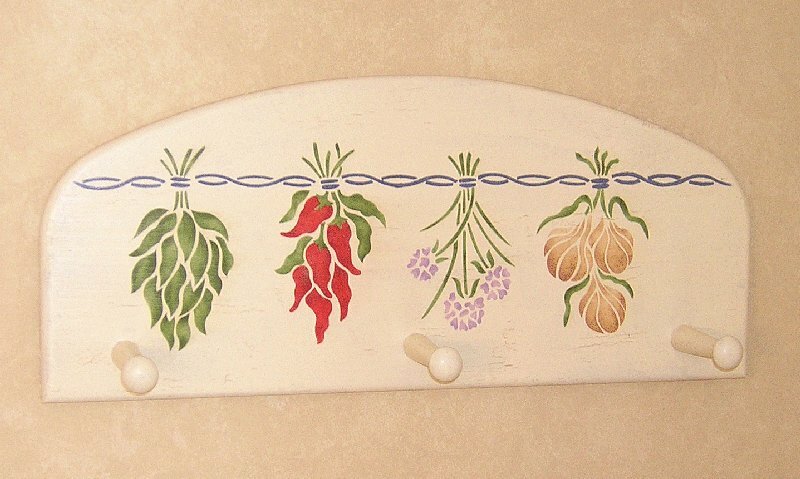 Why not spruce up your kitchen, mud room, or pantry with a colorful herb wall hanging? 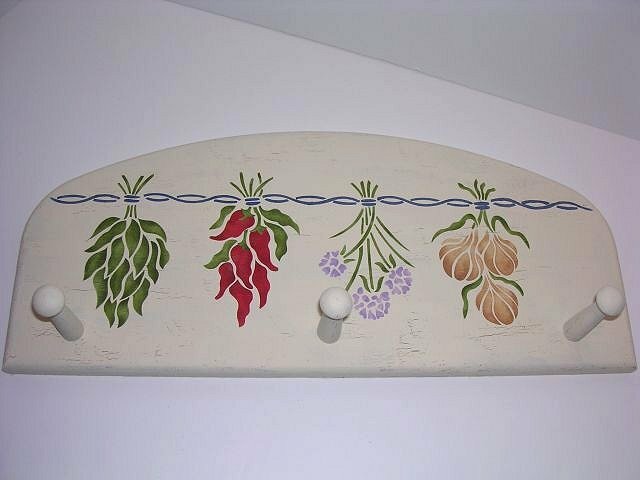 Complete with basil, peppers, chives and garlic, this delightful herbal shelf makes a wonderful addition to your kitchen or a thoughtful gift for friends and family. This project is great for beginners, taking 1-2 hours to complete. Prepare wood board for painting by sanding lightly, then basecoating with the color of your choice. Let dry. A823 has 3 overlays. Position overlay 1 (braided rope) on peg shelf. 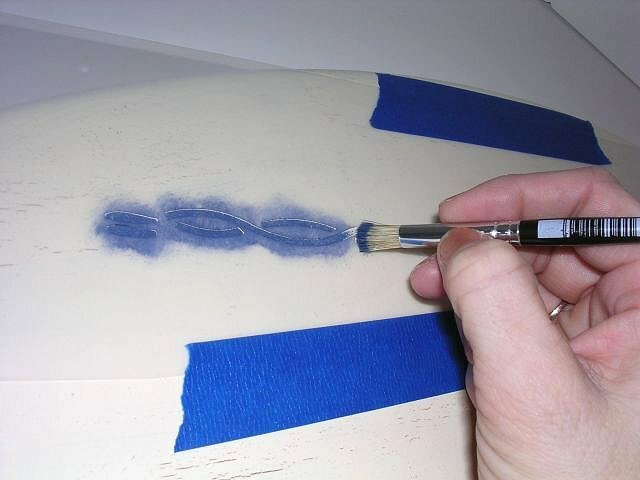 Apply Midnight Blue to stencil openings. Let dry. Position overlay 2, using the provided registration marks or by simply "eyeing" the design. Overlay 2 contains all of the greenery (stalks, leaves, pepper tops). Apply English Ivy to all of the stencil openings on overlay 2. Overlay 3 contains the peppers, chive flowers, and garlic. 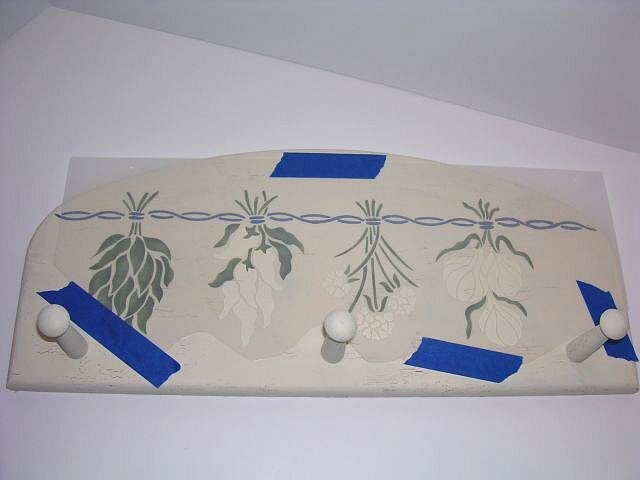 Apply the appropriate paint colors (Bright Red, Lilac Dust, & Caramel Candy) to the stencil openings. Let dry. A touch of Black was used for shading on the peppers. 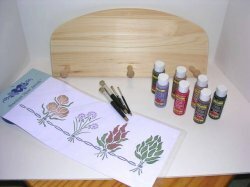 Apply a sealer to your peg shelf to protect your stenciling. We used a satin varnish. Voile!! You can add some personality to your projects by crackling the stencil surface (peg shelf). 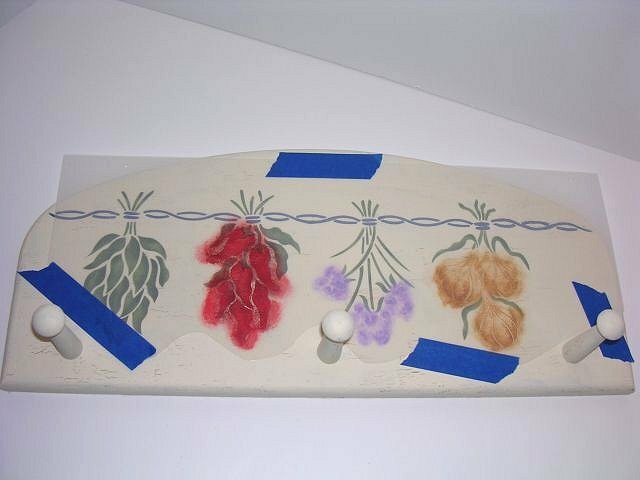 Basecoat the peg shelf with beige, allow to dry, then applied crackle medium. After thoroughly drying, apply an antique white. Let dry. Begin stenciling.